The 40,000-year-old "Mungo Lady" and the equally ancient remains of Mungo Man, found nearby in 1974, doubled scientific estimates of how long Aboriginal people had called Australia home. Lake Mungo is an icon, not only to Australians but to the world at large. The dunes bordering its dried-out shore contain the continent's oldest known human remains, and some of the earliest archaeological traces of Aboriginal people. This remarkable combination of cultural and environmental heritage transformed the national conversation around the deep connection to country of Aboriginal people. It ensured Lake Mungo and the other relict lakes in the Willandra region were inscribed on the UNESCO World Heritage list in 1981. Bowler's landmark discovery also instigated a new approach to research: the joining together of archaeologists, environmental scientists and traditional owners to illuminate the epic story of Australia's human and natural history. So what has been learnt over the past 50 years, and where to next? We have to go back some 130,000 years to set the scene for this epic, action-packed story. The tale begins during the last interglacial period (a time of relatively warm climate, similar to the present) and encompasses the subsequent ice age, which lasted until about 20,000 years ago. It traverses the ensuing eight millennia of warming temperatures and rising sea levels, as the planet entered the present interglacial period around 12,000 years ago. During the last interglacial (130,000 to 120,000 years ago), sea levels may have been a few metres higher than today and giant marsupials, reptiles and birds – the "megafauna" – roamed the continent. Super-sized kangaroos weighing 230 kilograms foraged across the landscape, along with three-tonne relatives of wombats and koalas and giant flightless birds. These creatures became meals for the gigantic venomous lizard, Megalania, and the carnivorous marsupial "lion," Thylacoleo. Swollen rivers channeled monsoonal rains from the tropical north into central Australia. Kati Thanda (Lake Eyre) was 25 metres deep and formed part of a vast inland water body with a volume equivalent to 700 Sydney Harbours. Eighty millennia later, ill-fated European explorers would search in vain for this long-gone "inland sea." Between 120,000 and 20,000 years ago, as Antarctica and parts of the Northern Hemisphere became encased in ice, sea levels around Australia fell by up to 125 metres. Northern Australia was joined by a land bridge to present-day southern New Guinea and eastern Indonesia, and people and animals could, at times, walk to Tasmania from the mainland. The resulting mega-continent of "Sahul" was 43% larger than modern-day Australia. By around 70,000 years ago, modern humans – Homo sapiens – began moving into Southeast Asia. There they may have encountered, exterminated or interbred with existing groups of archaic humans, such as Homo erectus, Homo floresiensis (the "hobbit" of Flores), and possibly the Denisovans – an enigmatic group related to Neanderthals. Making the jump across the Wallace Line – the biogeographical boundary that separates the Asian continental shelf from the islands of eastern Indonesia, a region known as Wallacea – into Sahul would have required several voyages across open water, even at times of low sea level. Visibility between islands may have encouraged island-hopping via a northern or southern route into Sahul, with the now-submerged islands off the coast of northwest Australia identified as a likely place for initial landfall. Perhaps these pioneering mariners were helped by favourable wind and ocean currents. From an Aboriginal perspective, people have always been in Australia, while scientific evidence of a human presence extends back as far as 65,000 years, to a time when Earth was heading deep into the last ice age. 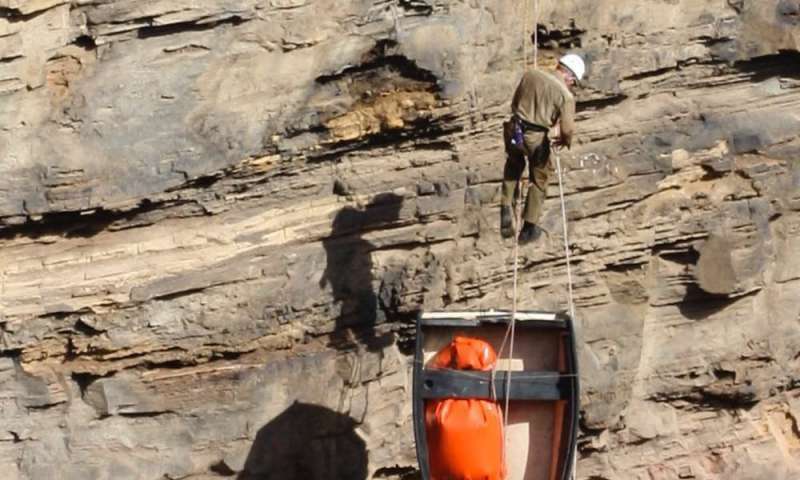 These trailblazers used advanced stone tool technologies and pigments, bone ornaments and burial rituals, such as the cremation and application of ochre to 40,000-year-old remains of Mungo Lady and Mungo Man. The speed at which people spread across this wide brown land appears to have been impressively rapid, both around the coasts and across the deserts. Barrow Island, off the Western Australian coast, and the Flinders Ranges, in South Australia, were occupied by 50,000 years ago, with the entire continent settled soon after. Many of the details of Australia's distant past are the subject of ongoing debate and research, not least over the nature of the interaction of people with the native fauna and flora. But a large body of evidence suggests human hunters had a hand in extinguishing the megafauna, perhaps after several millennia of coexistence. With the world descending into the grip of the last ice age, deteriorating climate probably also played a role in the megafauna's demise, with drying lakes adding pressure on already stressed populations. Australia's inland lakes have never recovered to their former glory, not even during the current interglacial. At the peak of the ice age (roughly 30,000 to 20,000 years ago), central Australia was drier and several degrees colder than today. Shifting sand dunes expanded over much of the arid interior, while ice caps grew and glaciers advanced in the Tasmanian highlands and in the Snowy Mountains on the mainland. The accompanying fall in sea level drained the Gulf of Carpentaria, and a freshwater lake almost three times the size of Tasmania was formed on the exposed continental shelf. People and animals retreated to locations where water and food were more assured. Relief came with rapidly warming temperatures and rising sea levels from around 15,000 years ago, which also separated Tasmania and New Guinea from mainland Australia. Coastal inundation recorded in Aboriginal oral histories would have disrupted and displaced populations, perhaps triggering the development of new social and subsistence strategies. By 10,000 years ago, the climate had settled into a pattern broadly similar to the present day. Aboriginal use of resources intensified exponentially and the largest Aboriginal language family, Pama-Nyungan, spread rapidly across the continent, replacing earlier languages everywhere other than the tropical north of Western Australia and the Northern Territory. Dingoes appeared on the scene about 4,000 years ago, around the same time "Tasmanian tigers" (thylacines) and devils disappeared from the mainland – although the dingoes were not necessarily to blame. These broad brushstrokes of history provide only glimpses into the rich story of Australia's Indigenous people and their cultural heritage. Continent-wide narratives also conceal important details of how Australia's climate and biodiversity have changed over the past 130,000 years, ignoring many of the contrasting views on how the past unfolded. There is always more to learn. We need fine-grained cultural and environmental records from all our diverse regions, from the coast to the outback. Long-term records of floods, droughts and bushfires need to be teased out of the dirt and other natural archives, and combined with new insights into how Aboriginal people adapted to the pressures of living on the driest inhabited continent on Earth. 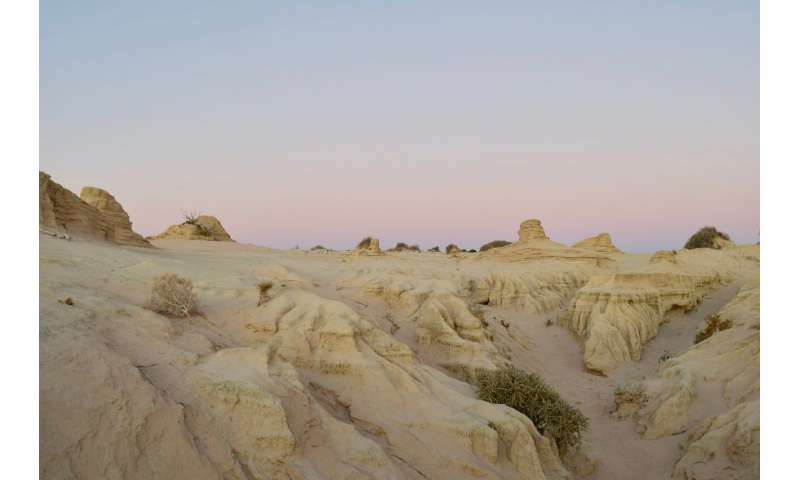 The revelations at Lake Mungo, half a century ago, set in motion a new era of collaborative exploration and discovery, by bringing together researchers from the sciences and humanities with the Indigenous knowledge of traditional custodians. This interdisciplinary and cross-cultural approach lies at the heart of the ARC Centre of Excellence for Australian Biodiversity and Heritage (CABAH). Our goal is to build partnerships between diverse researchers and Indigenous communities to transform our understanding and appreciation of the cultural and environmental history of this continent. Only then can we tell Australia's epic story in all its glory. When did Australia's human history begin? "From an Aboriginal perspective, people have always been in Australia, while scientific evidence of a human presence extends back as far as 65,000 years,"
Well I would have to say having existed on the continent for 65,000 is pretty much always. These people have remaining oral histories from the Pleistocene. These may be the oldest human stories on the planet. It is certainly unique. It's a shame and a crime that these stories are not gathered for all to know.